Vitiligo is one of the skin diseases that hasn’t been completely studied yet. It is a chronic condition with frequent relapses. Vitiligo can affect people of all ages, but in 70% of cases, it starts at the age of twenty. How to identify the disease at an early stage? People who suffer from vitiligo are very easy to identify. You don’t have to be a doctor to see’s specific white spots on the skin of the upper and lower extremities, face, and trunk. It is an acquired disease, and it has no genetic predispositions. The disease often affects people ages 20 to 40, with the same ratio in women and men, regardless of race and skin type. According to the WHO, 1% of the world’s population suffers from vitiligo. 4% of all cases happen in countries with a hot climate. Skin color is provided by the pigment melanin, which is a part of melanocyte cells structure. They contain enzymes and amino acids that contribute to the production of pigment. Under the influence of negative factors, this process can be disrupted. This disruption is what causes vitiligo and process of depigmentation of the skin and hair. Patients developing melanoma experience a regression of vitiligo. The disease reaches its peak in the summer due to increased sun activity. The self-destruction of melanocytes caused by an adverse impact of toxins during infectious processes. As a result, the cell walls are destroyed. The autoimmune effect. The pigment is destroyed by immune cells due to failure and erroneous recognition. Biochemical disorders destroy the pigment due to the improper production of the enzyme catalase, which neutralizes the free radicals that ruin melanin. Vitiligo brings mainly aesthetic discomfort to patients, particularly for women. The initial stages of the disease are characterized by minor local clinical symptoms, and the appearance of small spots, devoid of pigment, from 0.1 to 0.5 cm. The color may vary, being either white, milky, or a pale pink shade. The areas with the first spots are usually the face and hands. The surface of the spots are smooth and do not contain other elements of rashes (scales, papules, vesicles, etc.). The boundaries are clear, since the pigment has moved to the edge of the foci. However, pigmentation can be observed in the middle of the stain. Sensitivity is still experienced when pain and other uncomfortable sensations are absent. The centers of depigmentation increase rapidly in size, spreading throughout the body. They can merge, becoming quite giant in size.The function of sweat glands in lesion zones is disrupted. Vitiligo never affects the palms, soles, or mucous membranes. These facts are important for the diagnosis of the disease. 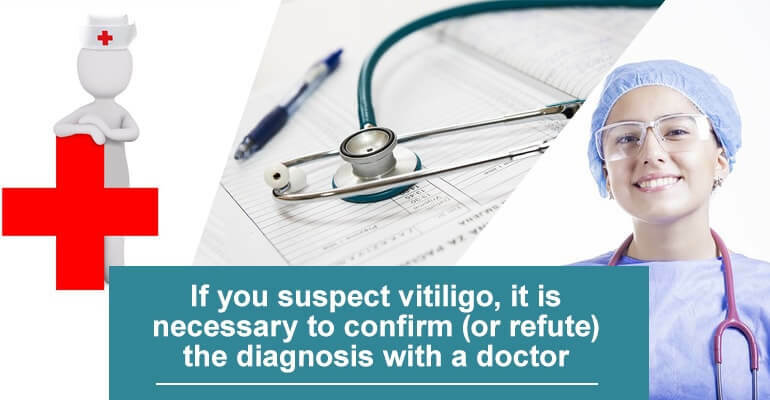 Besides the skin, vitiligo can also affect a patient’s hair by discoloration (graying), due to the loss of the pigment. Patients don’t experience any pain and don’t need to consult a specialist. Stationary type, which is characterized by a single symptom of white spots without spreading or increasing in volume. Progressive form, acute course with growing foci spreading throughout the body. Repigmentation develops under the influence of certain drugs or chemical agents, which leads to the violation of skin pigmentation. The disease is chronic and accompanies the patient all his life. However, there are cases of spontaneous recovery without any particular therapy. What can vitiligo be confused with? Leukoderma of syphilitic origin. In contrast to vitiligo, it affects the mucous membranes. Leprosy. With this conditions, spots are deprived of sensitivity or vice versa, causing painful sensations due to damage to nerve endings. Multi-colored lichen. 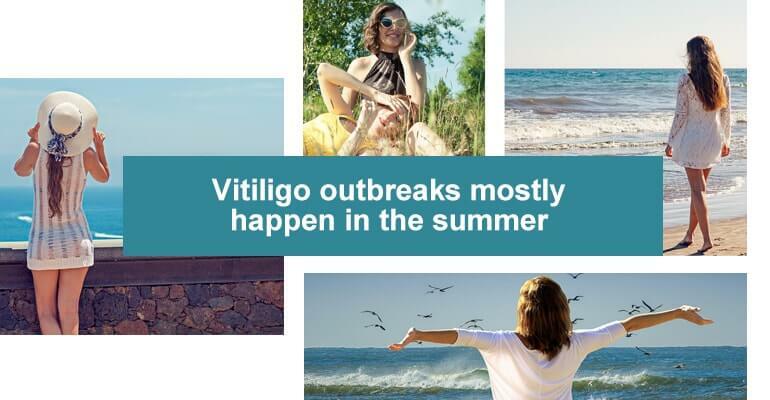 Spots appear in the period of remission and disappear when exposed to sunlight, which is not possible with vitiligo. Recent studies have shown that the affected skin is sensitive to ultraviolet rays. Today, UVB lamps are used successfully to remove local symptoms and prolong periods of remission. Positive results are already visible after the first or second week of use. 4 Comments on "Early Signs of Vitiligo"
It’s easy to diagnose, but it’s hard to understand why I got this. Can I cover the spots with foundation? Will a UVB narrowband lamp help if I am African American? UVB home therapy provides result irrelevantly to the skin color, gender, or stage of the disease.